A bunch of my friends have been impressing me with their culinary skills making ramen and miso soup. I’ve yet to try making ramen, but I’ve made a couple attempts at miso soup. The first time, I put in too much daikon (Japanese radish) and onion, and I did not have enough dashi or miso. Like Alex said, you cannot go cheap on either the dashi or the miso paste; I really tried to stretch my dashi the first time around. The second time it was better with appropriate modifications to each of those previous mistakes, but I did not have tofu, deep fried tofu, or green onion. Most importantly, however, I am still lacking that delicious “seven-spice” powder I would dump in my miso soup, in Japan. I bought a jar of what I thought was it, (looks identical) but it tastes totally different. Damn. So the miso soup situation is getting better, but I have to make special trips for ingredients that we don’t normally around the house; almost all of them. Inconbini desu yo! My other Japanese food adventure was making Japanese curry. Of course, I did not make the sauce. I used one of those Glico Curry boxes, and added it to some fried onions, carrots, potatoes and ooh-eeh-naa (wiener)! Dump that on some rice and it was surprisingly good! I may have to either a) learn how to make the Japanese curry sauce, or b) get some more of those Glico boxes. But enough of Japanese food. Let’s talk about my lunch today: a good, old fashioned Canadian lunch. 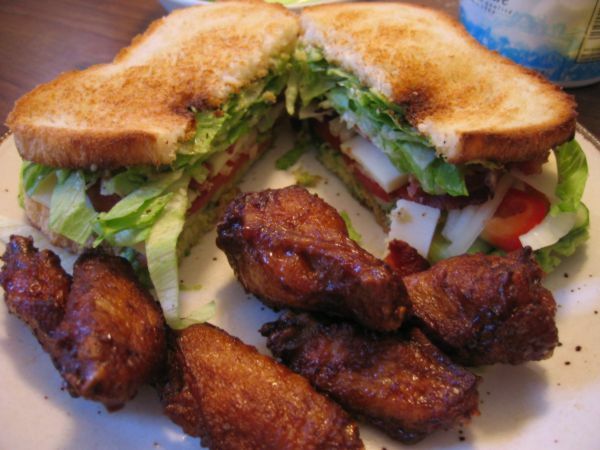 A toasted sandwich using home-made bread containing the following: bacon, mozzarella cheese, avocado, cucumber, lettuce, onion, red pepper, honey mustard, salt, and pepper. Oh yeah, and a side of honey-garlic chicken wings. Ramen artists, eat your heart out. hahahaha! Posted on Saturday, October 23rd, 2004 at 3:28 pm. What the heck does this have to do with canadian food?